Genesis places a region called Eden as the point of origin of Abraham's ancestors. Eden was a large well-watered area that was a distant memory by the time Genesis was written. Eden extended from the Upper Nile to the Tigris-Euphrates Valley. Genesis 2:10-14 says that Eden was watered by four rivers: the Tigris, the Euphrates, the Pishon and the Gihon. The first two are in Mesopotamia and the last two are in Africa. This is the heart of the ancient Afro-Asiatic Dominion and the place of origin of the ruler-priests and of "him that holds the scepter from the house of Eden" (Amos 1:5). The migration and kingdom building activies of Nimrod and the other Kushite rulers continued the custom of their more ancient ancestors who emerged in Africa about 200,000 years ago. DNA studies help to piece together a clearer picture of archaic populations, their migrations and the mixing of archaic peoples. Of particular interest is the migration of Haplogroup C, which traces lineage by the Y-chromosome. 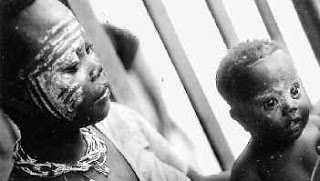 The Onges and Jarawas belong almost exclusively to Haplotype D, a subtype of Haplogroup C.
Some scientists believe that the aboriginal peoples of the Andaman Islands are the direct descendants of the first humans to migrate out of Africa into Asia. These aboriginal inhabitants of the Andaman Islands in the Bay of Bengal have physical resemblance to African pygmies. A DNA study of hair samples from Andamanese individuals confirms the link between these peoples. The study was done using hair collected by Alfred R. Radcliffe-Brown in 1907. Carlos Lalueza Fox (University of Cambridge) extracted DNA from 42 out of 70 hair samples and amplified a short segment of DNA from the mitochondria. Mitochondrial DNA traces lineage by the mitochondria, received from the mothers. MtDNA is less directly related to physical characteristics than chromosomal DNA and is believed to be less sensitive to the pressures of natural selection. Fox's research confirmed that the sequences of base pairs in the mtDNA fragments clustered closer southern African pygmies than to Asian ones. The negrito Andaman and Nicobar Islanders belong to M130 (Haplogroup C) designated by Spencer Wells, who leads the Genographic Project. The Ainu are another out-of-Africa group that has been traced. The Ainu originated in the Nile Valley and Sahara during the Holocene Wet period. They migrated as far Japan and also crossed into Europe and migrated to the eastern seaboard of Canada. The Ainu are in mtDNA haplogroup X. 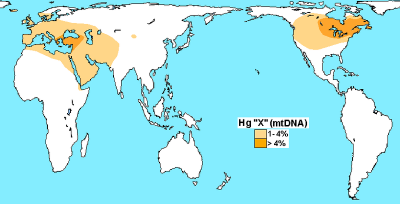 The dispersion of haplogroup X is shown below. The greatest concentrations are indicated by the darker shade. Note the small dot in Southern Siberia. This is the only known archaic HgX population in that entire region, indicating that the Ainu did not come to North America across the Bering Strait. According to Ainu oral tradition, they came into North America through Finland, Greenland and Labrador. The Ainu call themselves "First People" and are at the center of Luigi Cavalli-Sforza's genetic distance chart. The Ainu were the first rulers of the Lower Nile. One of their sanctuaries was called Annu, the original name for Heliopolis, to which the great pyramids were aligned. Abraham's Nilo-Saharan ancestors were sea-faring rulers who controlled the major water systems during the late Holocene Wet Period. Abraham's father Terah was associated with the Ainu temple of Het (Heth). Het also refers to a ruler-priest line found among the Canaanites. DNA studies have confirmed the migration of the Nilo-Saharan Kushites out of Africa.